The cable industry is continuously witnessing significant technological advancements. Development of cables focused on reducing current drop through the length of cable is one of the major milestones in energy conservation and safety enhancement in residential as well as commercial applications.With focus on enhancing fire resistivity, cable manufacturers have introduced ceramified cables for applications requiring longer evacuation time.The market for ceramified cable is forecast to grow steadily to become US$ 277.0 Mn by 2026 from US$ 175.8 Mn in 2017, at a CAGR of 5.2%. The global ceramified cable market is broadly segmented by voltage level, application, and end- use industry. Based on voltage level, the market has been segmented into low voltage (less than 600v), medium voltage (600v to 69kv), and high voltage (greater than 69kv). Based on application, the market has been segmented into fire and smoke detection systems, emergency lighting and signage, emergency communication, rescue elevators, emergency generators, and others. The market is further segmented on the basis of end-use industry into building, industrial, transit, and defense. Ceramified cable has been gaining traction over the last couple of years in developed countries due to incorporation of these products as a part of safety systems to improve fire safety. As a result, ceramified cables are undergoing further technological advancement in these countries, particularly in Western European countries, which has resulted in reduced price of these cables as compared to other fire retardant cables. This is considered to be a prominent factor fueling the growth of the ceramified cable market in Europe, as well as in North America. Moreover, ceramified cables in developing economies across the globe such as China, India, and Brazil, is witnessing increasing adoption due to increasing number of high rise buildings in these economies. The ceramified cable market in Asia Pacific is expected to be fueled by the increasing adoption in China, which is analyzed to grow at a compound annual growth rate of over 5.4% during the forecast period. Furthermore, other Asian countries, for instance India and Australia are projected to fuel the growth of the ceramified cable market during the forecast period. Based on voltage level, the market is anticipated to be dominated by low voltage ceramified cables because of deployment in a wide range of applications. In terms of applications, the market is anticipated to be dominated by fire and smoke detection systems throughout the forecast period. Emergency lighting and signage applications are expected to grow rapidly during the forecast period. Additionally, among end-use industries, the building end-use is anticipated to be the dominating segment followed by industrial use of ceramified cables. 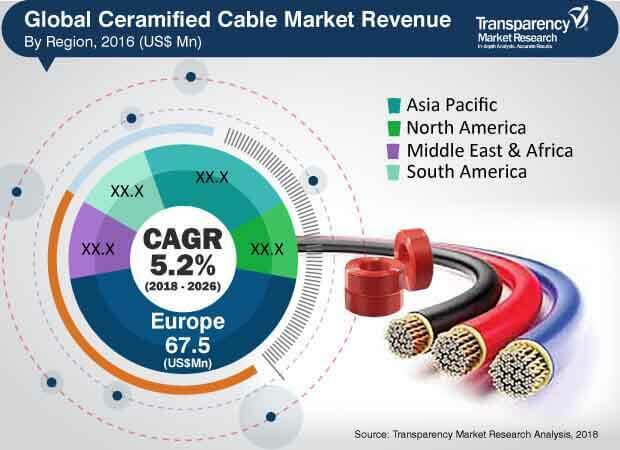 Some of the key players identified to govern the ceramified cable market are Wacker Chemie AG, Siccet SRL, Cavicel S.p.a., Prysmian Group, Nexans S.A., Marmon Engineered Wire & Cable (VITALink), Tekab Co. Ltd., Birtas Instrumentation Cables, Bhuwal Cables Ltd., and KEI Industries Limited.Some of the important strategies adopted by leading players in the global ceramified cable market are collaborations, acquisitions, partnerships, agreements, and new product launches. The report provides an in-depth analysis about the strategic business activities along with the market dynamics shaping the global ceramified cable market through the period of study. This comprehensive report by Transparency Market Research analyzes and forecasts the ceramified cable market at the global and regional level. The report provides analysis over the period 2016–2026, wherein 2016 is the historic year, 2017 is the base year, and 2018 to 2026 is the forecast period. An in-depth and unbiased market assessment has been made to offer readers in-depth and accurate analysis. The report emphasizes on all the major trends and services playing a key role in the growth of the ceramified cable market during 2018 - 2026. It also focuses on market drivers, restraining factors, and opportunities of the ceramified cable market during the said period. The study provides a complete perspective about the ceramified cable market throughout the research study in terms of value (in US$ Mn) and volume (in thousand kilometers) across various geographies, including Asia Pacific, South America, North America, Middle East & Africa (MEA), and Europe. The report includes a detailed value chain analysis, which is focused on providing a comprehensive view of the global ceramified cable market. Porter’s Five Forces Analysis highlights the competitive scenario in the global ceramified cable market. The study incorporates market attractiveness analysis, wherein the market segments for example, voltage level, application, and end-use industry are benchmarked based on their market size, growth rate, and attractiveness in terms of opportunity. In order to give a complete analysis of the overall competitive scenario in the ceramified cable market, every geographic region mentioned in the report is provided with attractiveness analysis. Additionally, the report also provides analysis of different business strategies being adopted by market leaders of the ceramified cable market. Market introduction chapter assists in gaining an idea of different trends and services related to ceramified cables along with their voltage levels and applications. The study provides a decisive view on the global ceramified cable market by segmenting it on the basis of voltage level into low, medium, and high voltage. By application, the market has been classified intofire and smoke detection system, emergency lighting and signage, emergency communication, rescue elevators, emergency generators, and others, By end-user, the market has been segmented into building, industrial, transit, and defense. The report provides a detailed breakdown of the ceramified cable market region-wise and categorizes it based on various applications, thus providing valuable insights at micro and macro levels. The report further highlights the competitive scenario within the ceramified cable market, thus ranking all the major players according to key recent developments and their geographic presence. The insights for the ceramified cable market are the result of our extensive primary interviews, secondary research, and in-house expert panel reviews. These market estimates have been analyzed by considering the impact of different economic, political, social, legal, and technological factors. On the basis of country, the North America market is bifurcated into Canada, the U.S., and Rest of North America. The Europe market is analyzed across the U.K., Germany, Italy, and Rest of Europe. The Asia Pacific ceramified cable market is also segmented at the country level which includes China, Japan, India, and Rest of Asia Pacific. Middle East & Africa region covers the GCC countries, and Rest of Middle East & Africa. Similarly, South America region includes Brazil and Rest of South America. This report provides all the strategic information required to understand the ceramified cable market along with its voltage level and application. The report also provides insights related to the components and different application according to the various geographical regions mentioned above. The research methodology is a perfect combination of primary research, secondary research and expert panel reviews. Secondary sources include annual reports, company websites, SEC filings and investor presentations, national government documents, internal and external proprietary databases, statistical databases, relevant patent and regulatory databases, market reports, government publications, statistical databases, etc. Primary research involves telephonic interviews, e-mail interactions, and face-to-face interviews for detailed and unbiased reviews on the ceramified cable market, across geographies. Primary interviews are usually conducted on an ongoing basis with industry experts and participants in order to get latest market insights andvalidate the existing data and analysis. Primary interviews offer new and fresh information on important factors such as market trends, market size, competitive landscape,growth trends, etc. These factors help to validate and strengthen secondary research findings. Moreover, the data collected and analyzed from secondary and primary research is again discussed and examined by our expert panel. The research study includes profiles of leading companies operating in the global ceramified cable market. Market players have been profiled in terms of attributes such as company overview, financial overview, SWOT analysis, business strategies, and recent developments. Some of the key players in the ceramified cable market are Wacker Chemie AG, Siccet SRL, Cavicel S.p.a., Prysmian Group, Nexans S.A., Marmon Engineered Wire & Cable (VITALink), Tekab Co. Ltd., Birtas Instrumentation Cables, Bhuwal Cables Ltd., and KEI Industries Limited. Companies are focusing on expanding their business through strategic acquisitions and partnerships with several end-use industries.